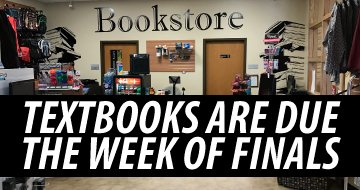 Books checked out from the bookstore must be returned to the UA Rich Mountain Bookstore by December 14, 2018. Books can be returned at anytime if no longer in use. Any books returned after this date are subject to late fees or full cost of the book. Thanks!